Christmas is just 5 weeks away and while most of you will be holding out til 1 December to put up your Christmas trees, I just couldn’t wait! This year I went with a bit of an OTT look for my tree — embracing tree picks like the metallic berry branches and oversized glittery flowers from Balsam Hill as well as loads of large crystal ornaments. While there’s no wrong way of decorating a Christmas tree, these are my secrets if you’d like to emulate my style. 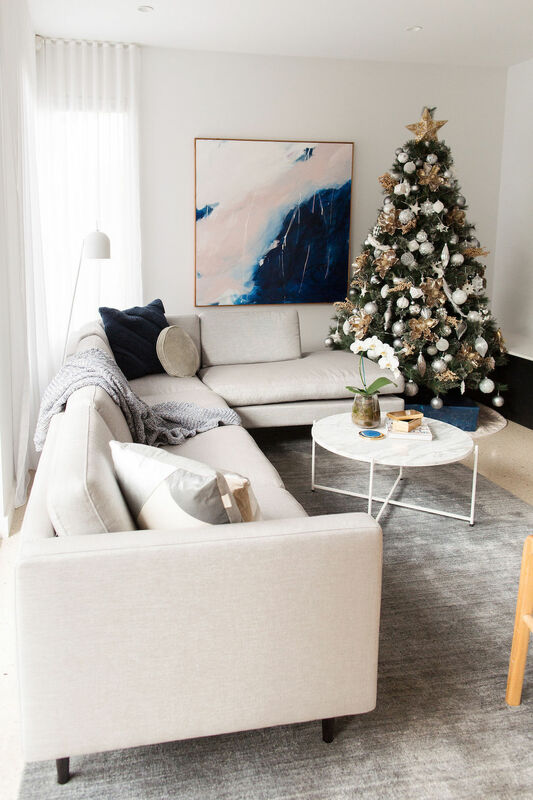 This sounds like an obvious starting point but truth be told, on the weekend I’m going to move my tree from the living room into our dining room because I’ve realised this is not the best spot for our tree this year. Many of us will change things about in our house and earlier this year I made over our living room and got a bigger sofa so my old ‘perfect spot’ for the tree looks a little bit cramped this year and doesn’t allow enough space for gifts under the tree. Whereas last year our dining room was also a makeshift playroom but a few months ago I made a secret cubby for Patrick under the stairs and all of his toys are now there which has freed up this space for a tree. 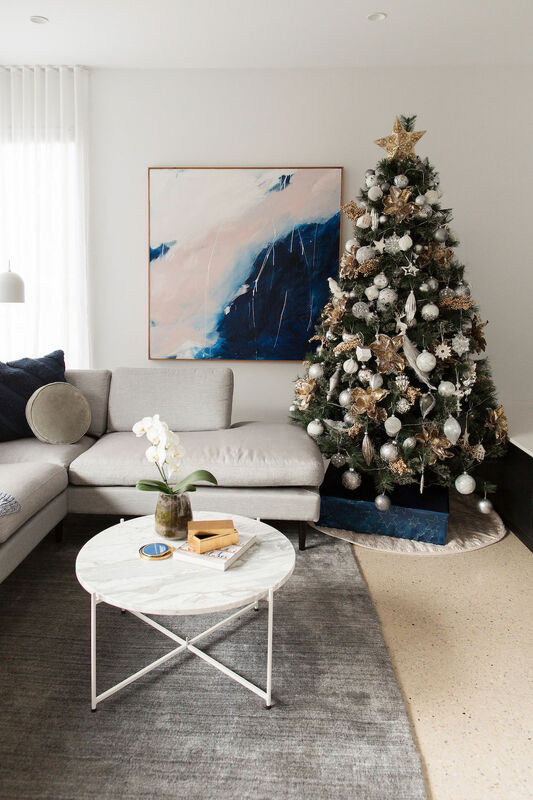 Likewise in your home, you may have purchased new furniture, moved things about, or just never found the ‘right’ spot for your tree. Look for a place that’s in a low traffic area but close to a powerpoint so you can add lights. 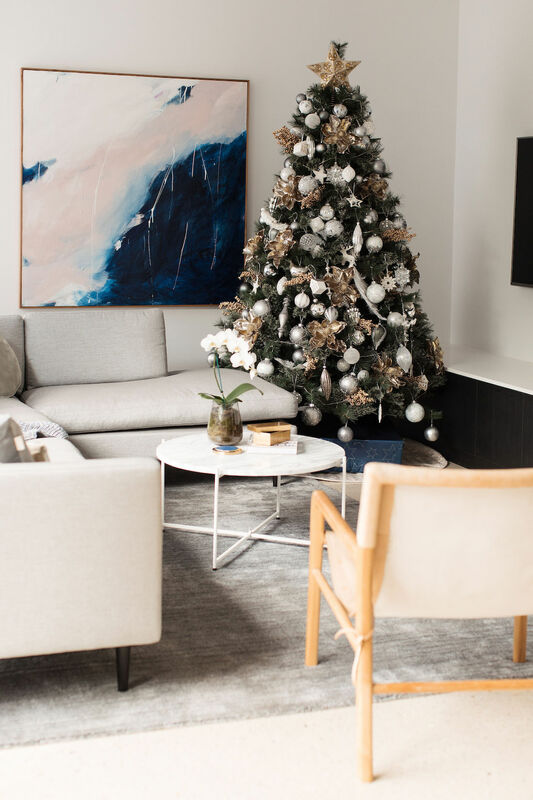 Create presence for your tree and give the base a sophisticated look by using either a tree skirt or a tree stand (such as a woven basket or planter box). This year I picked up a luxe new tree skirt from Balsam Hill and love the subtle quilted detailing. Light should be added before the decorations so the wires can be somewhat hidden and to avoid the risk of knocking off ornaments and breaking them. I’ve used a traditional technique of running the lights around the tree but there other methods such as running lights along individual branches and looping the lights at the end (you can check out this YouTube video on how to do that). 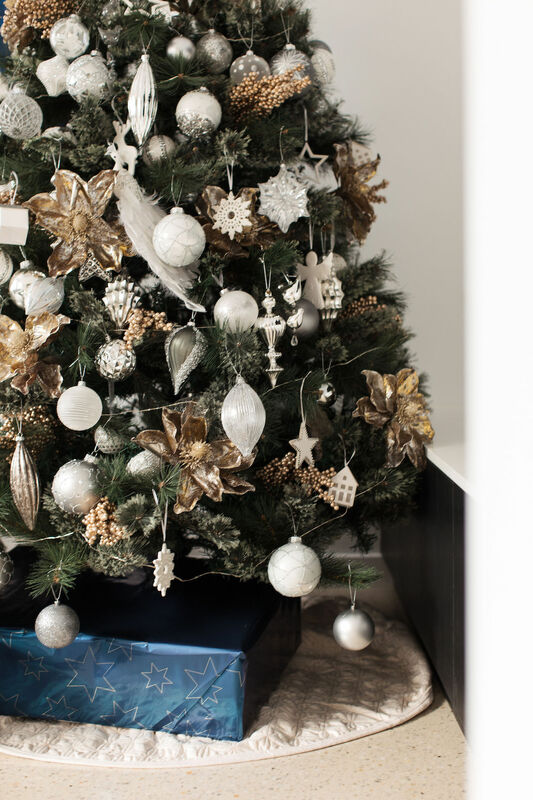 This year I added two types of tree picks to create a much fuller and more OTT look. Large magnolia flowers and clusters of golden berries add a big dose of bling and I love the contrast of the large flowers with smaller ornaments. You can find all sorts of tree picks on the market now, including a beautiful range from Balsam Hill here. I’m addicted to buying Christmas decorations and every year I add to my collection but they don’t come cheap! That’s why I start with plain baubles that are bought in mass, or filler ornaments as I like to call them. 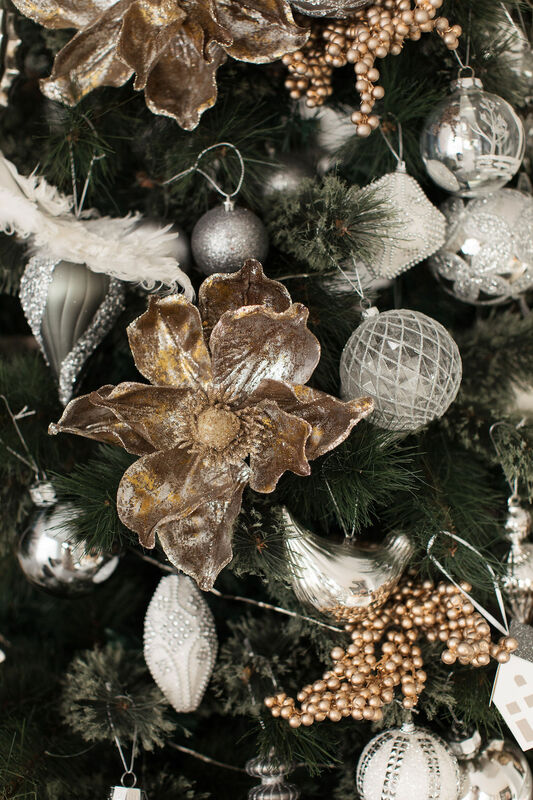 I use these simple ornaments all over the tree to form a backdrop for the more decorative ornaments. Now it’s time to bust out your pretty, decorative ornaments. I have a mix of large crystal ornaments, clay decorations, and even a few feathered birds too. Focus these at the front of the tree where they’ll be seen and appreciated. I think it always looks best when there’s a theme to your decorations. 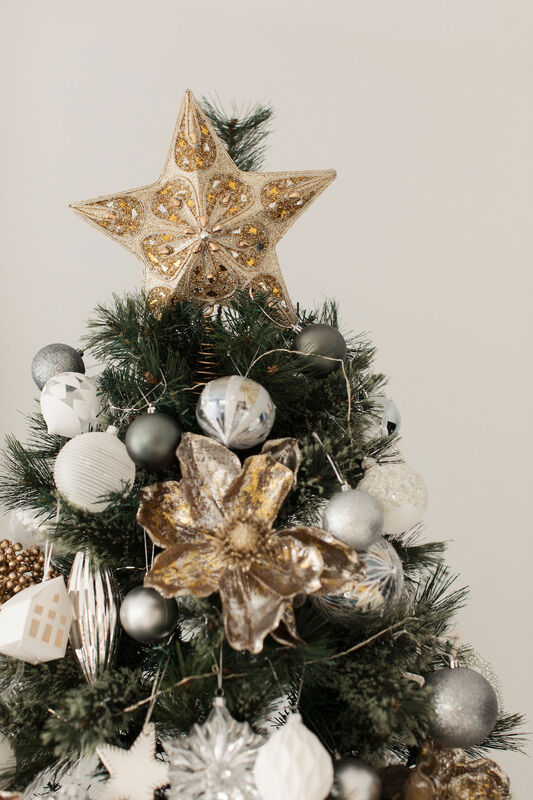 This year I’ve gone with silver and gold (taking inspiration from the new silver and gold star I got for the top of the tree) but there are endless ways you could decorate your tree — bright and colourful, winter wonderland, red and gold… you decide! For interest, I also suggest playing with the shape and size of ornaments. 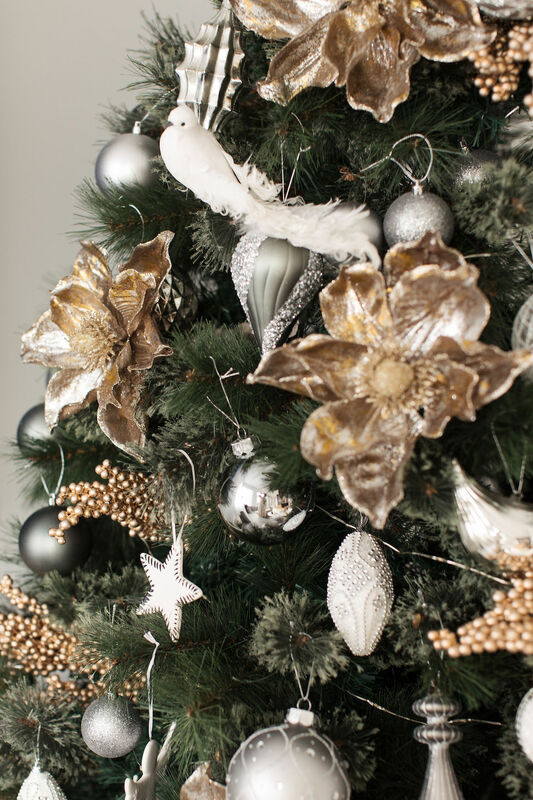 You’ll see I’ve used some long, dangling ornaments with shorter round ornaments — don’t be shy to introduce a range of shapes. To finish the look, you have to add a gift or two… even if you haven’t started gift shopping you can fake it by wrapping a plain box. Sounds ridiculous, I know, but I don’t think a tree looks right without at least one gift under it! 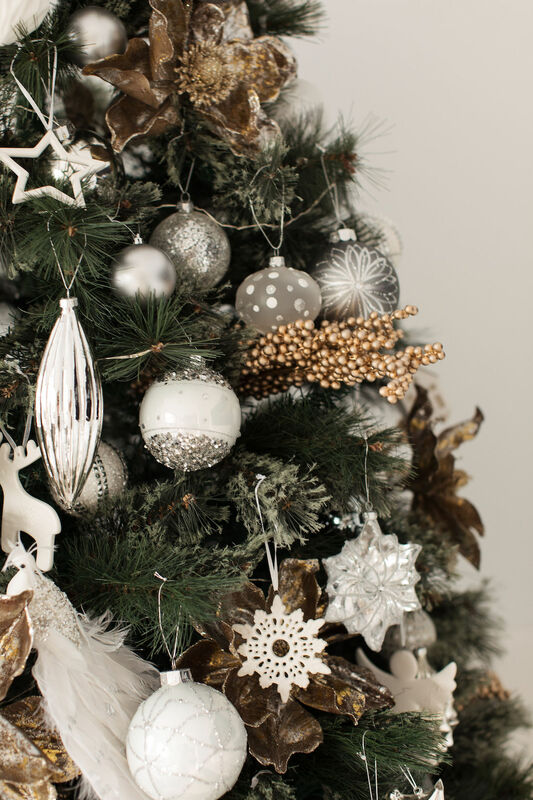 So there you have my top Christmas tree decorating tips, do you have more you can add? Share them in the comments. 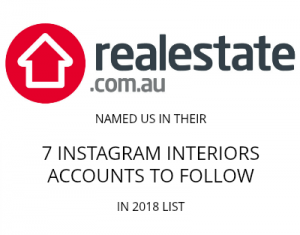 I’m yet to add some Christmas vignettes around my home and will share photos of these when I do (most likely on Instagram and you can follow me here). Next articleHow to pick the right dining chair: Your comprehensive guide to getting it right!